Designed for skid steers, the LPSB series scrap bucket attachment provides material handling on the construction site for moving demolition debris, rocks, brush, and dirt. Ideal for storm clean-up, landscaping, or moving hard to handle materials. Features 3,000 psi cylinders with cylinder guards to protect the cylinders and components. Hoses are equipped with "connect under pressure"
hydraulic flat-faced coupler set. 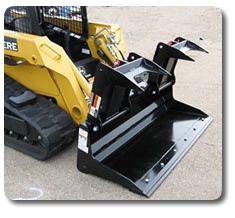 The skid steer scrap bucket's cutting edge is drilled to accept an optional replaceable and reversible beveled cutting edge which provides increased bucket strength while extending bucket life. Scrap Bucket has 2 - 3,000 psi cylinders that are protected by guards. Cutting edge is drilled to accept a a replaceable beveled cutting edge.